As you are probably all aware, January 3rd was Tolkien's birthday — his twelfty-second as the Tolkien Society ingenously calls it. Sigh! So now Tolkien ‘was a code breaker during the Second World War’ (no he wasn't!) and ‘is believed to have been a large factor is Lewis' conversion from atheism to Christianity’ (the word is ‘_known_’, not ‘believed’). I am still extremely sceptical of the idea of a Tolkien ‘biopic’ — mainly because I am convinced it will not only get things wrong, but it will also emphasize some events / experiences out of proportion because they make for good drama. And these concerns are essentially my best-case scenario. On Jason Fisher's decision to step down as editor of Mythprint, the quarterly bulletin of the Mythopoeic Society. Being a list of Tolkien-related events in 2014 that Marcel has gathered. A big ‘Thank you’ to the Tolkienist for this excellent work! An article about a lawsuit by Miramax LLC against Warner and New Line for a bigger slice of the cake. The case is not really interesting in itself, but as an illustration of the legal complexities and the intricate squirming involved in these cases of rights it is nonetheless enlightening. ‘Beowulf in 100 Tweets’ (19 Jan) — though a funny idea, and one that can surely be enjoyed by those who know the poem, I am not convinced that it is always a good idea to deprive old tales of the characteristics that give them their particular and individual power and force. ‘'The Torrent of the Human Race:' The Concept of Movement in the Works of Saint Augustine and Its Impact on the Medieval Imagination’ (22 Jan) — St. Augustine has been mentioned as one of the church fathers likely to have influenced Tolkien's personal philosophies, or at least his philosophical considerations. ‘The Canterbury Tales as Framed Narratives’ (25 Jan) — Tolkien famously worked with Chaucer both as a scholar and a teacher (the failed Clarendon Chaucer and Tolkien's essay ‘Chaucer as a Philogist: The Reeves Tale’ are probably the best known examples). And of course the idea of framed tales is also central to all of Tolkien's Middle-earth writings (I do not mean to suggest a causal connection here — just a curious parallel). ‘http://www.medievalists.net/2014/01/25/st-brendan-and-his-miraculous-food-heavenly-meals-for-a-legendary-voyage/’ (25 Jan) — St. Brendan ... Imran ... ‘The Notion Club Papers’ ... read here for a bit of extra background. ‘Figures of Evil in Old English Poetry’ (25 Jan) — One of the things that have occupied me in my studies of Tolkien is the philosophical underpinnings of his work, and this title recalls Tom Shippey's excellent essay on Tolkien's ‘images of evil’. ‘Medieval English for Dummies’ (30 Jan) — a half-hour video of a presentation about medieval English, from the language of Beowulf over practical pronunciation exercises of Middle English to an interesting comment about the modern status of English as a global Lingua Franca (yes, I do realise the irony here) as preventing any basic change. Tolkienian events at K'zoo — followed up in the following post (fittingly named ‘More Tolkien at 2014 Kalamazoo’). In celebration of the hundredth anniversary of ‘the first known public reading of Tolkien’s epic prose.’ The title introduces a series of posts on the origins, history and evolution of Tolkien's legendarium (I first, erroneously, took it to be a tongue-in-cheek naming of this report of a meeting in the Stapledon Society the beginning of Middle-earth, which might be stretching it just a bit). It is interesting to see that there are certain elements of the narrative style that can, in more mature versions, be traced on to the epic prose of Tolkien's legendarium. A talk that Sørina Higgins gave at New York C.S. Lewis Society on January 10th ‘about The Fall of Arthur and an imaginary, composite, Inklings Arthuriad’. The video shows the slides with the talk, but unfortunately not any subsequent questions and answers (I doubt that this is because there were no questions). Though I am still sceptical of Sørina Higgins' use of a a conglomerate Inklings Arthurian mythology as a device for investigating their Athurian excursions, I do find her comparative work intriguing. For those who can read Swedish (or make do with e.g. a Google translation), the reports from the Swedish Tolkienseminariet are always gold-mines of information. I try not to spend much (if any) space here on the film-adaptations of Tolkien's work — I agree with what Corey Olsen said of Peter Jackson's films (at the time, I think it was the LotR films only), that one needs to see them as something wholly distinct from Tolkien's work; it is a different story happening to different characters in a different world. Lately, however, there has been some nonsense going about that the changes to The Hobbit are really based on what Tolkien would have wanted, and I have suggested that I might write something up about it. It turns out, however, that David Bratman has already written this, and as usual much better than I could. Morgoth, Xena the Warrior Princess, Greek legend ... There are some curious parallels that Ilverai points out in this post, but ultimately, I am not sure if it leads anywhere — or if it is intended to lead anywhere but to the pointing out of some curious parallels. About a chapter by John Rateliff that is to appear in The Kobold Guide to Magic. The book itself is focused on the magic systems of role-playing games, but Rateliff will be writing on magic in Tolkien's works. I am sorely tempted to find myself a copy of this book — having played also my share of role-playing games, it would also be fun to see the discussions of RGP-magic, though I cannot imagine that Rateliff's approach will be to look at Tolkienian magic in the game-mechanics discourse typically used in RPG contexts — such an approach would, in my view, not be conducive for an understanding of magic in Tolkien. An interview, as the title says, with Jemima Catlin, the celebrated new Hobbit illustrator. A collection of very good pictures (pencil, I believe) based on The Silmarillion. The text is in Russian, but an automated translation is good enough to identify the topics quite well. Chapter illustration for The Silmarillion chapter 7, ‘Of the Silmarils and the Unrest of the Noldor’ (the title text is an error — it is correct in the illustration, though). Treebeard is seen walking towards Merry and Pippin in his Wellinghall on the morning of the Entmoot. Well, not in print yet, but it will be :-) A call for submissions to issue 6 of Silver Leaves. ‘Every chapter of J.R.R. Tolkien's Silmarillion, as illustrated by Dresden Codak author Aaron Diaz.’ Diaz describes his motivation as creating ‘a Middle-Earth visually unique from the style of the Peter Jackson films,’ adding that he likes the films, but misses ‘the days when there was more diversity and interpretation to Tolkien illustrations.’ The visual representation he creates is certainly different from most of what I have otherwise seen, but very fascinating in its unique expression. Contents from these blogs will only be reported here if there is something that I find particularly interesting, or posts that fit with a monthly theme, but I will here comment very shortly on any Tolkien-related posts in the month covered by these transactions. One Tolkien-related posts in January 2014, cited above. One post in January 2014 — see above. Six Tolkien-related posts on the Tolkien Library in January 2014 — three small articles and tree on books, a call-for-papers (Sørina Higgins' The Inklings and King Arthur), an announcement (facsimile edition of the first edition Hobbit) and a review (Devin Brown's Hobbit Lessons). 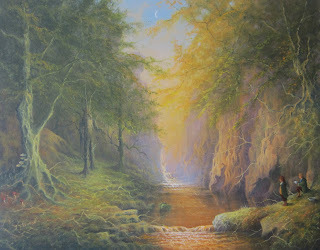 Seven Tolkien-related posts from John Rateliff in January 2014. One on the occasion of Tolkien's birthday, one relating to Bernal (‘The Thought Police’ from 7 Jan), announcing the arrival of The History of the Hobbit for Kindle, the post on Tolkien and magic (see above), one on what, at the face of it, looks a very far-fetched attempt to link Tolkien's Middle-earth to Abyssinia, and the two posts on the Kalamazoo Tolkien-programme referred to above. 5 (more or less) Tolkien-related posts in January 2014. In addition to the most excellent list of Tolkien-related events (see above), Marcel has also proven that ‘It simply isn’t an adventure worth telling if there aren’t any dragons’ and ‘Fantasy is escapist, and that is its glory.’ are NOT by Tolkien — let's take that again: those quotations, though often MISattributed to Tolkien, are NOT by him at all. (Ah! That feels better!) Oh, and there are also a couple of other fan-activity-related posts. 2 Tolkien-related posts in January 2014 — both referred to above. 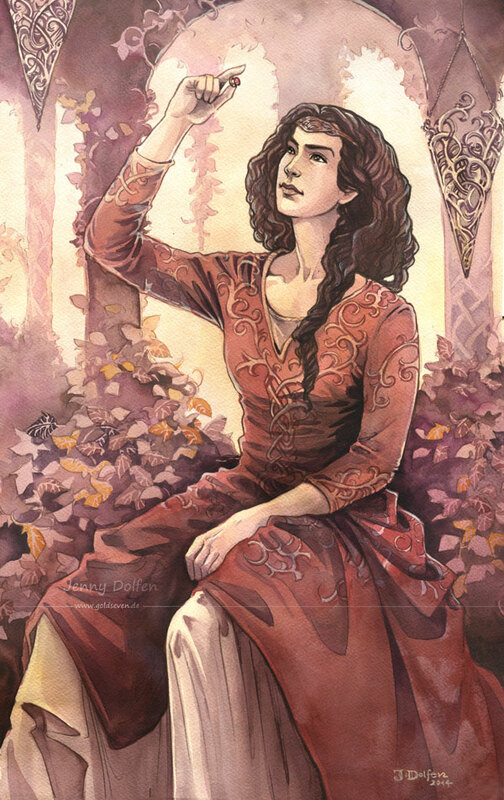 One Tolkien-related painting in January 2014 — a tutorial featuring a role-playing character from Tolkien's work. No posts in January 2014. Two posts in January 2014, one spreading the word on the call-for-papers for Humour in and around the Works of J.R.R. Tolkien (Walking Tree) where the deadline has been extended to March 3rd, and one referring to Marcel Aubron-Bülles' list of Tolkien-related events and John Rateliff's posts on the Tolkien at K'zoo programme. 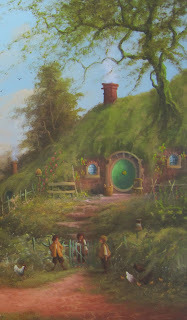 2 Tolkien related posts in January 2014. The Southampton Reading Group has had their usual two meetings in January, first ending their reading of Sigurd and Gudrún and then starting on The Fall of Arthur. As always the reports of their discussions are very much worth reading (if ever I'm in the area in time for a meeting, I will certainly be begging to be allowed to sit in on it). Eight story-internal Tolkien-related posts in January 2014 (and two relating to the Peter Jackson films). 2 Tolkien-related posts in January 2014: the review linked to above and a brief mention of Charlton's own first encounter with Tolkien's work. I have updated my description of John Garth's “100 Years of Middle-earth” post following clarification from John – it turned out that the title was not a tongue-in-cheek reference to the discussions of when exactly Tolkien's started on his legendarium, but rather a foreshadowing of something far more interesting.